I just wanted to make this thread because I feel like people have forgotten how good Paul Pierce really was. It bothers me when I read things like Isaiah could end up being the best Celtics scorer since Bird. Or how when Pierce gets mentioned they talk about him as this floor bound crafty Veteran who wasn't all that exciting to watch but was just really effective. IMHO, Pierce is the most underrated player of his generation if he were in the league today in his prime he'd be a top 10-15 player. His legacy was basically trashed because he stuck around for a rebuild process and wasted some of his best years. There seem to be some misconceptions about him due to fans tuning in right at the start of the big 3 era. Keep in mind he was 29 then that's pretty much smack dab in the middle of most players prime years (27-32 nba prime years, IMO) he was polished but athletically he was starting to decline. That combined with his reduced role in the offense due to him accommodating a new system for the greater good on a contending team. But still when things fell apart and the offense was stagnant he would come to save the day with his superman(old school Pierce pre-big 3) act. There are 2 major misconceptions about Pierce. Misconception 1: He wasn't an exciting player to watch. Completely false he when he was on it was a shot more so than Isiah, IMO. He could get turnover prone but he did a lot with the ball (crossovers, hesistations, step-backs, spins there is no move he didn't have to get his shot off). He was also good for the occasional dunk/facial. Misconception 2: He was slow and unathletic. False again. He was far from unatheletic if anything he was an above average athlete, if you watched him before the big 3 came to town you should know that. He wasn't Vince or Kobe but he was pretty much just a notch or so below them. On a scale of 1-10 I would've put Pierce as a solid 7, Kobe being an 8.5 and Vince a 10. I mean this in the nicest way possible, but Isaiah couldn't shine Pierces shoes on the basketball court. That's how far I feel the gap is between the two. Hopefully we keep this thread going and people keep adding stuff. The difference between Pierce and Isiah is when Pierce has it going there's nothing you can do to stop him. No defender no game plan, ask Lebron or Kobe. One of my favorite videos from Paul Pierce and the Big Three era. Once he got going not much was stopping him. Loved his dunk on Camby and the Nuggets AND when he got rolling against rookie Durant and the Sonics. The Captain will NEVER get old around these parts. TP! You speak the Truth, nothing but the Truth! All Time Great! All Celtics Team! The problem with Pierce is that the NBA is a rep league and once a player gets a certain rep, it's very hard to shake it. Before KG came on board and they won a title, Pierce had been cemented in a lot of people's minds as a guy who'd had a brief run at NBA relevance with 'Toine and then slid back to being a non-superstar. He was in the category with guys like Rashard Lewis, maybe at the top of that category but definitely not in the group a step above. Go back to 2007 and ask people "Pierce or Vince Carter" and most probably would have said VC, even though Pierce was the better player at both his peak and over time. Now, even thought he's got that ring, it's too easy for those old opinions to resurface. Ever since Paul turned it around (see night club stabbing and Indy series with bandages) by far my favorite "all time" celtic of his generation. I put him up there with bird, Hondo, Russ etc. That's all tied in to him being on some horrible Celtics teams with a bunch of no name players around him (Jiri Welsh, Ricky Davis, and Wally). Unfortunately for him there's nothing he could really do about it with Danny rebuilding the team around him. Thank god Danny's master plan worked out otherwise Pierce would be forgotten in history. Most of these kids don't even realize how versatile and dynamic of a wing he was. Paul is in my top 5 Celtic list. He was a gamer who could finish at the rim through contact (amazing how many players now can't) and could hit the clutch deep shot with time running out on the clock. He also dug in on defense. Love my captain. Summer time so I'm watching highlights on youtube and found myself watching some great Paul Pierce videos. Pierce scores 48 points staging a comeback against the Nets in December 2001 after starting the game 1-16. He finished 17-18 from the FT line. Pierce scoring 46 against Philly in Game 5 of there 2002 1st round playoff series. Pierce finished 16/25 overall, 8/10 from 3, and 6/7 from the line en route to a blowout. Paul Pierce was the key architect behind banner 18. I know Ainge put the pieces together, but I've always felt Paul was the driving force behind the franchise putting a championship team together. He wanted to win a title but he also wanted to win here in Boston. Sure, he could've gotten traded and won a title somewhere else, but he wouldn't have gotten as much satisfaction. He wanted to win and wanted to win as a Celtic. 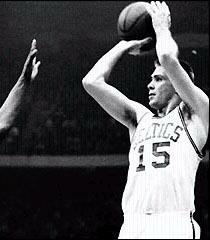 Clearly a top 5 Celtic and in the same conversation with Russell, Bird, Cousy, Heinsohn, etc. Here's hoping the torch is passed. Need a finals MVP, very good (to elite) defense, clutch shooting, good facilitator, and leadership added to his repertoire and Jason will be good to go. 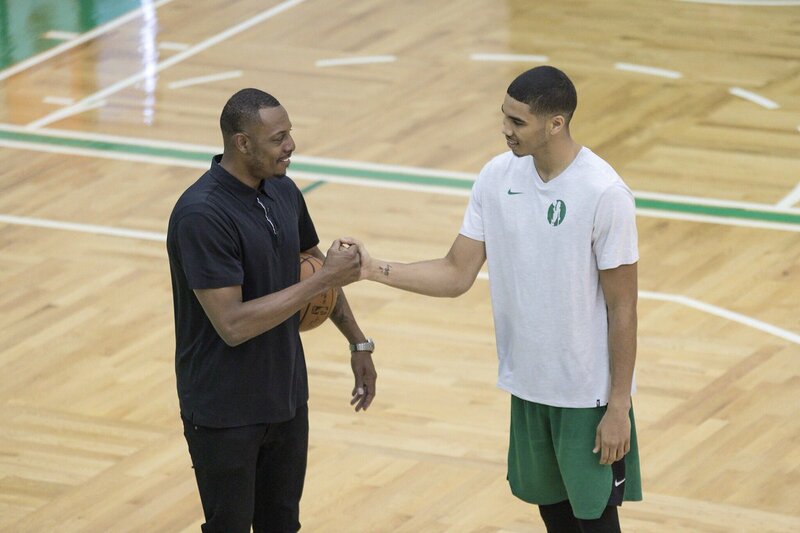 After last year's playoff run Tatum is well on his way. Keep working young fella. Make PP34 proud. If Jayson has half the heart Paul did, his career will be a massive success. Rightfully, props are given to Paul for his craftiness, world class foot work, and uncanny ability to draw fouls, but what people often overlook is the fact that he had the heart of a lion. He fully embraced taking the gutsy shots, guarding the best players, and if he's on your team you never feel like you're out of a game no matter what the point differential is. As a Celtics fan, seeing Pierce evolve as a player and person, through a ton of adversity, was an absolute joy. I'll never 1. like and respect a player more and 2. be happier for a player when they get to hoist a banner to the rafters. I really hope Jayson gets to experience that one day. With THIS team, I really believe he will. This team is unselfish enough to make it happen. Add in the fact that Gordon Heyward has "Unfinished Business" and Kyrie is trying to make a name for himself makes for a very similar collection of circumstances like 2007-08. Looking VERY forward to next year and seeing Paul Pierce in the stands enjoying it all. Paul Pierce is my favorite player of all-time, he is the reason I became a Celtics fan. He went to our country in 2003 and toured universities, and luckily he went to ours. I had a picture taken (sadly my phone was snatched) with him and had him autograph my Antoine Jersey (he laughed, and I explained that Pierce Jersey was unavailable at the time I bought it). He was already my favorite player then, and I was just amazed that he didn't miss a shot while warming up.